Line the bottom of a 9×13 pan with parchment paper. Add chocolate to microwave safe bowl and microwave in increments of 30 seconds stirring the chips each time until chocolate has completed melted and mixture is smooth or melt chocolate using double bowl method. Spread melted chocolate as evenly as possibly into lined pan, make sure that it is not too thick. Place pan into freezer for 20 minutes. Repeat the same melting process with the white chips. While chocolate is still smooth, stir in half of the crushed candy cane mixture. Allow the white chocolate to slightly cool for a minute. 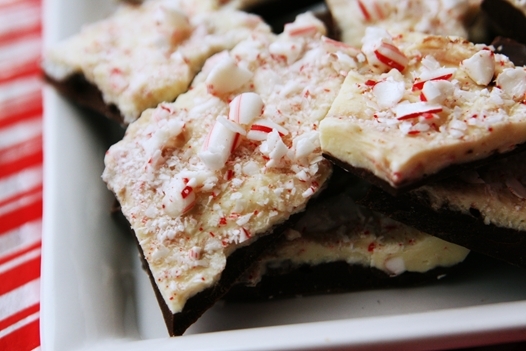 Remove pan from freezer and spread white chocolate/crushed candy canes mixture on top of the chocolate layer. Spread white chocolate as quickly as possible. Top off with remaining crushed candy cane and gently pat down with the back of a spatula. Return pan to freezer for 20 minutes. Remove from freezer and gently lift the whole mixture from the pan with a butter knife. Remove parchment paper and break into pieces. Stores nicely in freezer or up to one week in refrigerator.